Earl was born and raised right here in Jamestown. God called him to preach the gospel on April 29, 1994 and he was ordained in 1995. Earl has served in many capacities over the years, SS teacher, youth minister, evangelist, and finally pastoring. His heart's desire is to see lost people saved, and to see saved people grow in their relationship with the Lord. Earl and his wife, Kristin Johnson Sweat have been married for 25 years and have 9 beautiful children. Gary was born in Cookeville TN, and has served churches in Ohio, Georgia, Indiana and Tennessee. 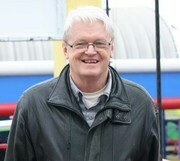 Gary is married to Yvonne Mullins and has three daughters. Veronica Fowler has recently begun her work as our Ministry Assistant. She is quickly learning the ropes and obtains a great outlook for what God has in store for her at First Baptist Church Jamestown. Bessie Sells has celebrated over 30 years as Custodian of the First Baptist Church, Jamestown. Thank you Bessie for a wonderful 30 years , and looking forward to many more!